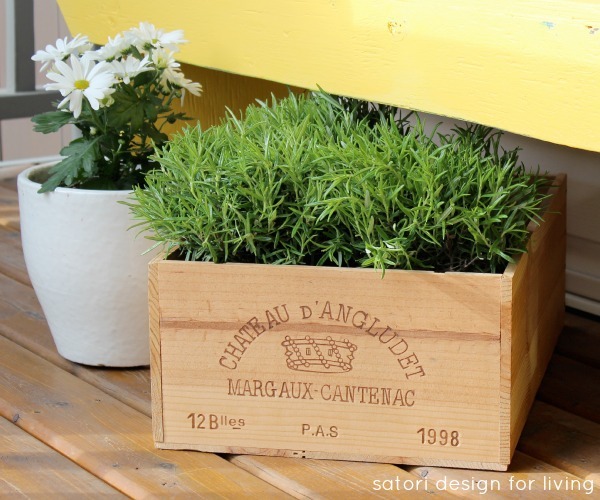 Ready to do some early spring gardening? 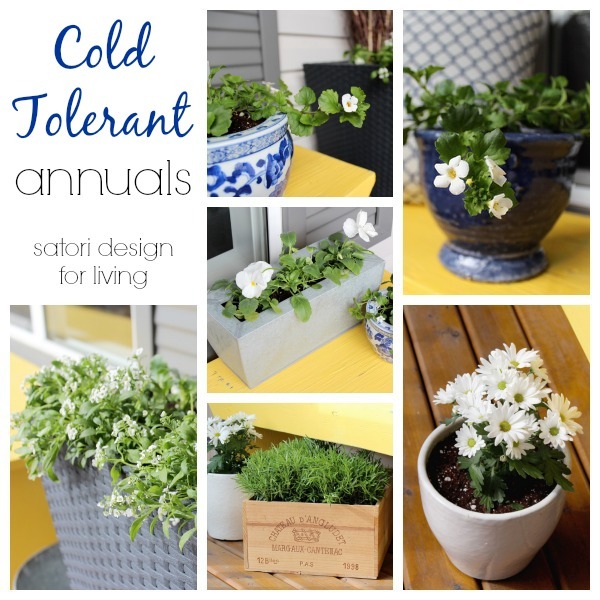 This list of cold tolerant annuals will add some life to your outdoor space after a long winter! This has been a challenging spring for gardening to say the least. Will the snow ever stop? Usually by this time, my Lily of the Valley is peeking out of the ground. It is the flower for May after all. Not this year. Notta. It’s not even brave enough to come out yet! When I was decorating our front porch last week, I knew the chances for more cold weather were pretty good. What plants could I put in my containers that wouldn’t be too wimpy? It didn’t take long to realize there are quite a few cold tolerant annuals available at the garden centres right now. Although I was going for a white flower theme like last season, there are many options out there for adding colour too. Bacopa is an annual I’ve never planted before. I adore their tiny white blooms with yellow centers, and apparently they’re fairly low maintenance in the growing season. Bacopa can tolerate cool weather, but not a hard frost like some other annuals. Cover or take inside if it looks like it’s going to freeze. Don’t let the name Pansy fool you. 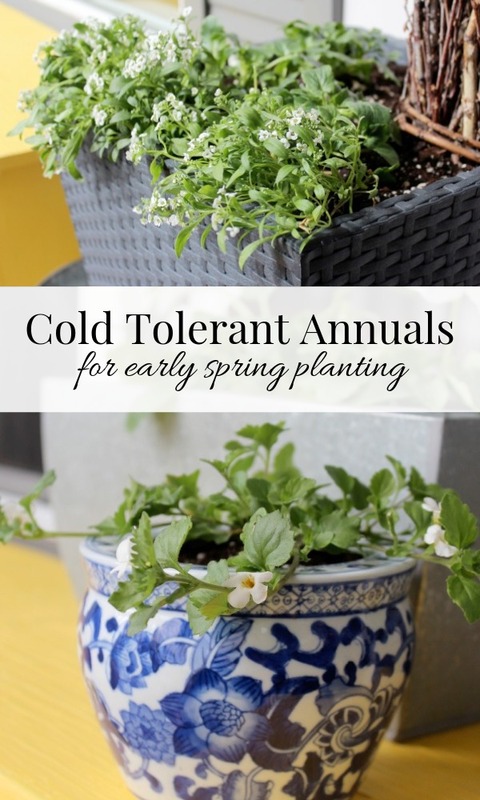 These plants are hardy and can even tolerate light frost. Look for them in colours, too, such as purple, yellow, blue, orange and more. 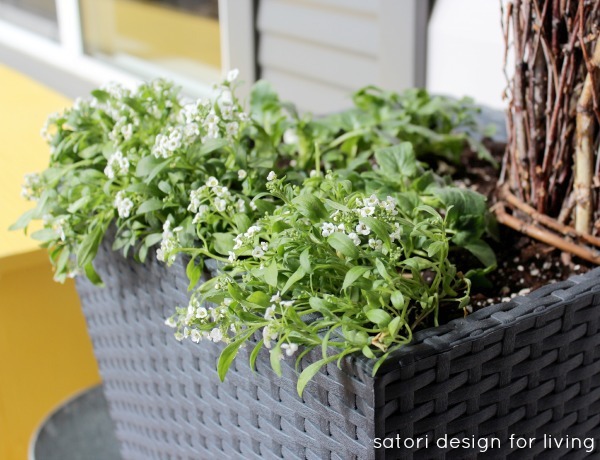 Alyssum plants do well in the cool weather and will bloom throughout most of the growing season. Most varieties are like pansies and can tolerate some frost, making them good contenders right through to late fall. The herb rosemary is an annual in our area (zone 3b), but will sometimes keep in our garage over the winter, acting more like a perennial. Rosemary is a very frost-resistent and low-maintenance plant that’s great for adding flavour to dishes all summer long! Chrysanthemums are favourites due to their tolerance in a range of weather. 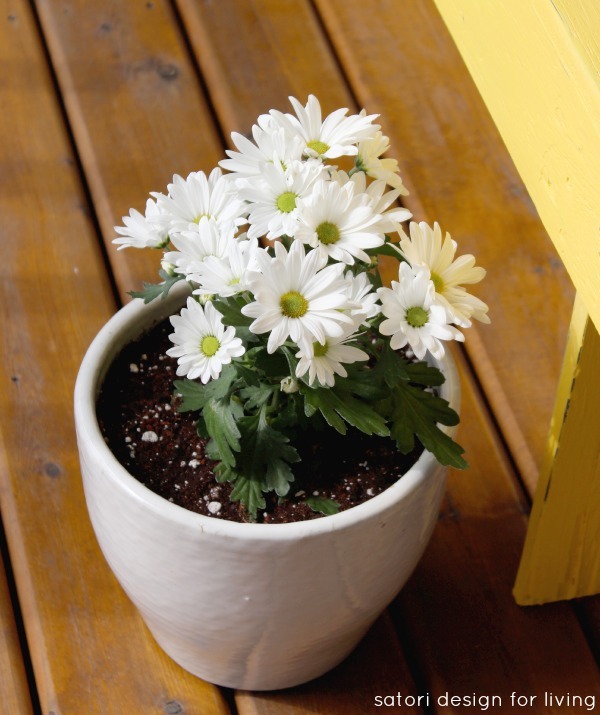 In the spring, I usually select white or yellow mums so they don’t fade throughout the summer like the darker blooms do. What are some of your favourite annuals to plant in early spring? Have you lost any plants this year to frost? P.S. 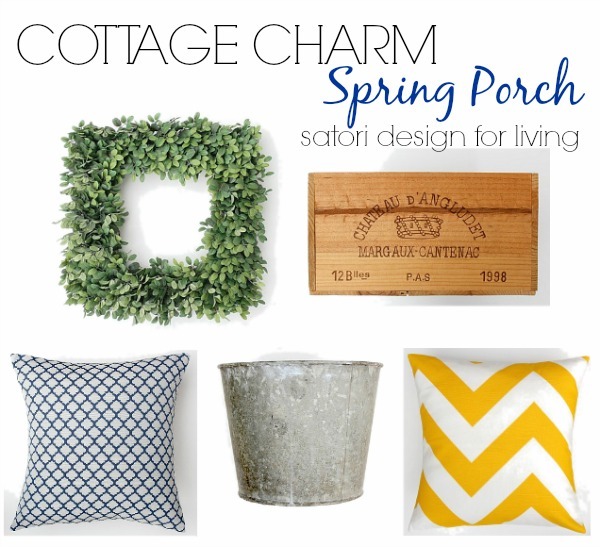 Have you checked out my Spring Front Porch yet? If not, head over there now! Also, don’t forget the Outdoor Extravaganza starts next week. 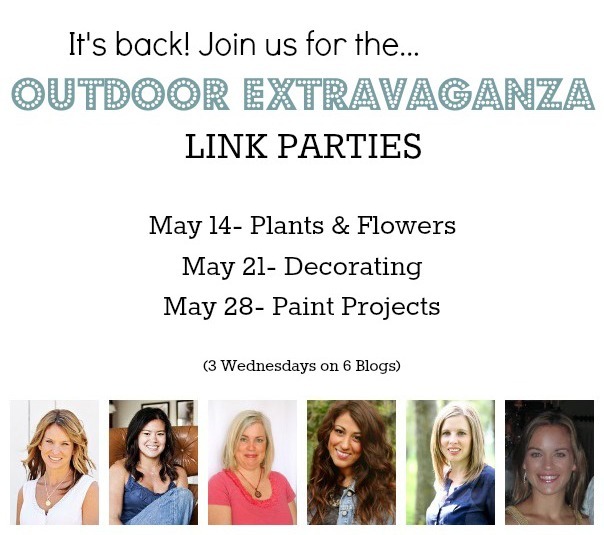 Can’t wait to see your Plants & Flowers projects! I’m a huge fan of pansies! 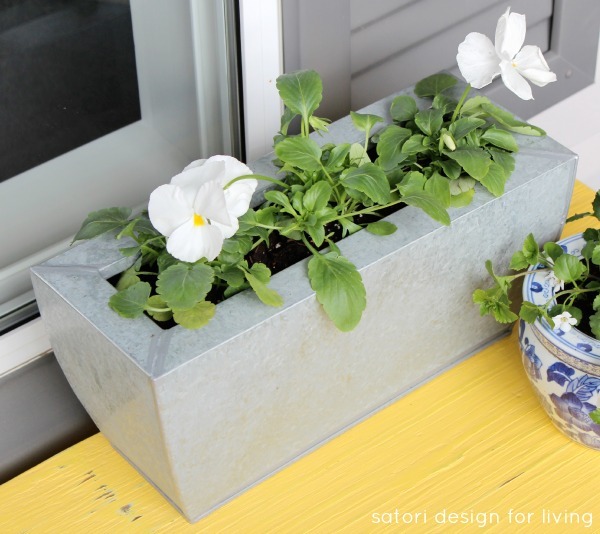 Lambs ear is another favorite – its super hearty and volunteer plants itself at random if you let it, primroses, dianthus, blackeyed Susans… I’ve only ever planted Alyssum and Bacopa in hanging baskets, and haven’t made any baskets for a long time… I love your pansy planter!! I’ll have to check out lambs ear- that’s a new one to me. Anything that can handle our range of weather I’m up for. It froze so hard last night! I like your all white blooms (except the Lavender) on your porch Shauna and thanks for the plant info. I have lot’s of Lambs Ear too (come and get some Sheila and Shauna!) and I do lot’s of Bachelors Buttons, it reseeds itself and blooms for a long, long time! For annuals I love nasturtiums, I’m growing a lot this year and putting them all over in containers and baskets – it’s going to be wild! Awesome Shauna! I have no idea what I’m doing in the garden… so this is just perfect timing for the porch. Working on the bench right now, looking for the perfect plants to finish off the whole look! So pretty Shauna!! Love your cold tolerant plants and heading over to visit your cottage porch now!! Thanks for sharing this. It is Autumn here in Australia and Winter is fast approaching so I need some pretty plants for the cooler months. I might plant some pansies! I’m the world’s worse gardener so thanks for this info. 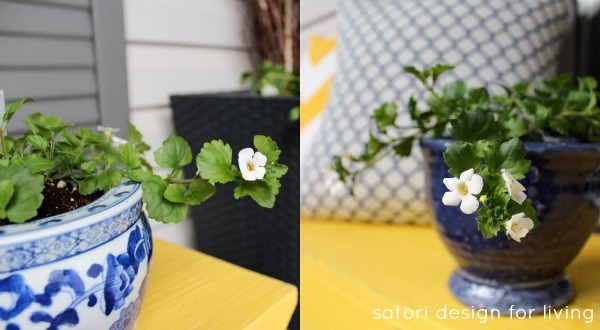 I love the look of white annuals in blue pots – so pretty! Great choices, Shauna! I love white flowers and these all look so beautiful! You are inspiring me to do something with my front porch!